Keep skin safe in the sun with the Vichy Ideal Soleil Hydrating Mist SPF50, a broad spectrum, invisible sunscreen specially formulated for sensitive skin. Delivering a refreshing veil with a dry touch finish, the high performance mist utilises a broad spectrum filtering system with Mexoryl® XL for maximum sun protection without leaving white marks or visible residue. 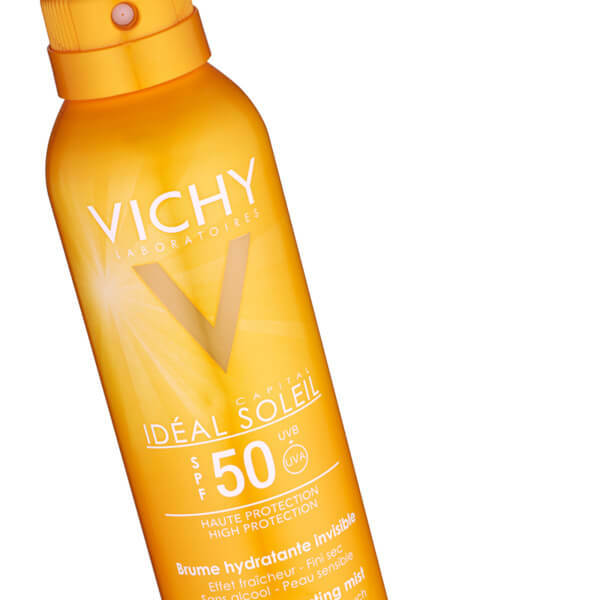 Enriched with Vichy Thermal Spa Water, the hydrating sunscreen will calm and regenerate skin, whilst its dose of Glycerin and emollients provide unrivalled moisture. 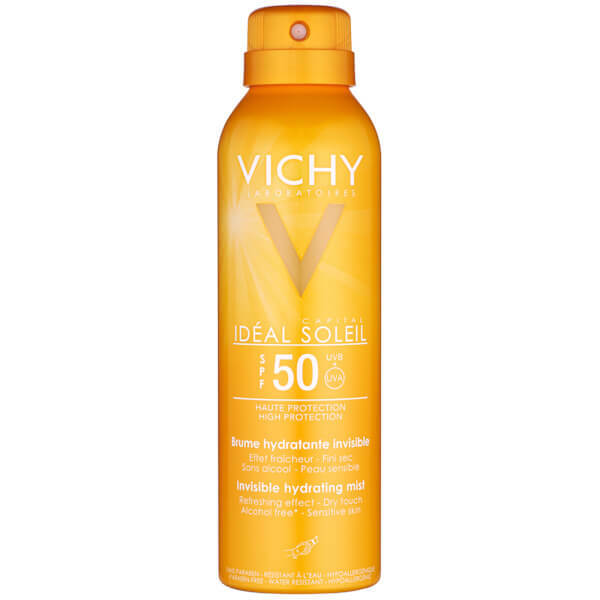 Drying in seconds, it will leave skin safeguarded, soft and radiant. Hypoallergenic and tested on sensitive skin under dermatological control. Shake well before use, until you hear the ball inside move. Do not spray directly on to the face. Avoid contact with the eyes. In case of contact with the eyes, rinse them immediately and thoroughly. Avoid contact with fabric. Butane, Aqua / Water, Homosalate, Dicaprylyl Ether, Octocrylene, Glycerin, Ethylhexyl Salicylate, Dimethicone, Butyl Methoxydibenzoylmethane, Styrene/Acrylates Copolymer, Drometrizole Trisiloxane, Peg-30 Dipolyhydroxystearate, Nylon-12, Dicaprylyl Carbonate, Methyl Methacrylate Crosspolymer, Cyclohexasiloxane, Polymethylsilsesquioxane, P-Anisic Acid, Caprylyl Glycol, Disodium Edta, Disteardimonium Hectorite, Dodecene, Ethylhexyl Triazone, Isododecane, Lauryl Peg/Ppg-18/18 Methicone, Peg-8 Laurate, Phenoxyethanol, Poloxamer 407, Poly C10-30 Alkyl Acrylate, Propylene Carbonate, Sodium Chloride, Tocopherol, Parfum / Fragrance.